I had never seen Master John Wyclif so afflicted. He was rarely found at such a loss when in disputation with other masters. He told me later, when I had returned them to him, that it was as onerous to plunder a bachelor scholar's books as it would be to steal another man's wife. I had, at the time, no way to assess the accuracy of that opinion, for I had no wife and few books ...' So begins another delightful and intriguing tale from the life of Hugh de Singleton, surgeon in the medieval village of Bampton, near Oxford, and bailiff of Bampton Castle at the behest of Lord Gilbert Talbot. 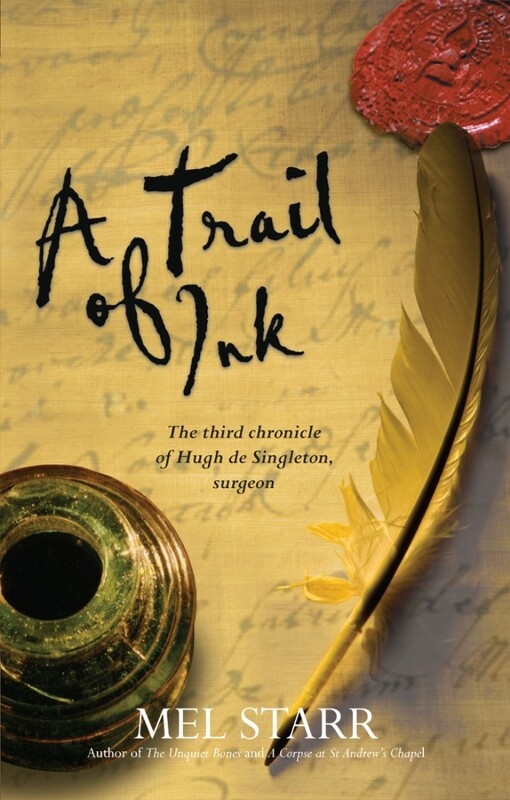 A Trail of Ink by Melvin R. Starr was published by Lion Hudson in October 2010 and is our 15009th best seller. The ISBN for A Trail of Ink is 9781854249746. Another book of a series no other reviewer gets a chance to read! Hugh’s friend Master John Wycliffe of Canterbury Hall, Oxford has had his lifetime collection of books stolen from his room. Twenty-two books in all, two borrowed from a friend, twenty lovingly collected and annotated over many years of study. Hugh was in Oxford to further his cause with the stationer’s daughter Kate, on the excuse of ordering more ink to write up his records of completed cases. As bailiff to Bampton Castle he was expected to solve local crimes from poaching to murder, and so far he had been successful. Back in Bampton Castle Lord Gilbert, at the request of his wife Lady Petronilla, speaks to Hugh of his love lorn state and using the loss of Master John’s books as a worthy cause, sends Hugh back to Oxford to solve the mystery of the theft, and to find himself a wife. Though he has the help of a sturdy groom, Arthur, finding the books is no easy task, and wooing Kate meets with difficulties too. There are evil men afoot, murder and mistaken identity, monks and nobles, all are involved, and much happens before the end of the story. I just started this seris and think its wonderful. I can't wait for the next one. Got a question? No problem! Just click here to ask us about A Trail of Ink.